A Jones fracture is a specific type of metatarsal stress fracture. It is a stress fracture of the fifth metatarsal that often occurs in running and jumping athletes. The majority of stress fractures of the metatarsal bones are similar to the ones described in the injury post on metatarsal stress fractures. These typically occur in the middle or distal portion of the fifth metatarsal (the one closest to the outside of the foot). A more worrisome location for an injury to this bone in athletes is at the proximal aspect, meaning closer to the heel. These injuries can either be stress fractures that occur over time or complete fractures that occur after an acute event. 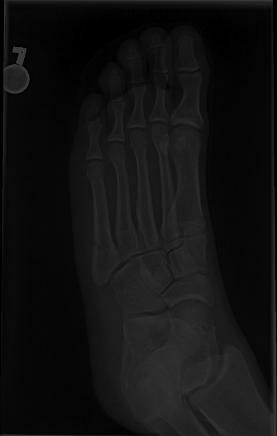 Note the fracture at the base of the fifth metatarsal (outside of the foot). In the office, the sports medicine physician will examine the player. If there is tenderness at the base of the fifth metatarsal, suspicion for fracture is raised. X-rays are obtained initially. If a fracture is seen in the middle or distal aspect of the bone (closer to the toes), this injury can often be treated without surgery. A walking boot or even a wide-based shoe can be used to protect it until the fracture heals. If the fracture is located at the base of the bone (the proximal aspect), and the patient is a fairly athletic person or especially a high-level athlete, surgical treatment is often considered. Surgery for a Jones fracture consists of placing a screw down the bone to compress the fracture and get it to heal. Surgery is often performed on athletes because there is a fairly high nonunion rate from this injury in athletic people. Soccer players are in my experience the most common athletes to undergo this surgery. Fortunately the fracture usually heals uneventfully, so return to sports is very likely. Unfortunately the fracture often takes 6-12 weeks to heal, so a significant amount of time is missed from sports. 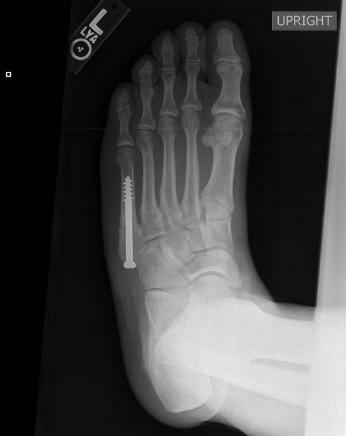 The surgeon has inserted a screw down the center of the fifth metatarsal in this professional athlete.